Black Friday is fast approaching and here in the UK, 91% of retailers took part in last year’s event. As always, each year consumer habits and trends evolve and 2017 was no exception. Last year, Black Friday shoppers spent an astounding £1.39bn and in the shape of things to come, a significant 39% of that spend was generated by smartphone purchases alone. In another unexpected turn of events, the newly dubbed Sofa Sunday (the Sunday after Black Friday) outperformed Cyber Monday last year, highlighting how consumer spending extends well beyond the original one-day extravaganza. The week-long online and in-store offerings have long since outgrown the clambering and chaotic sales of the early 2000’s. Our research shows that smartphones are playing an undeniable role in the evolution of our Black Friday experience. In fact, 9 in 10 people are switching between mobile devices whilst completing a purchase, enabling them to tailor their shopping experience to their needs more than ever before. Given the access and abilities of our mobile phones, more people are clearly researching and price comparing well in advance of their Christmas shopping but crucially, around 93% of these people go on to make a purchase. Interestingly, almost 80% of people have also used their mobile phone to shop online with 20% doing so at least once a day. In fact, 35% of shoppers also expect that their smartphone will become their primary tool for purchases in the near future. With smartphones and m-commerce playing such a pivotal role in the way consumers now shop, retailers have a real opportunity this season to engage with shoppers through mobile messaging and further streamline their online journey. The future of Black Friday? Mobile messaging, sending the right communication in real-time, can have an undeniable impact on your Black Friday results. Sharing discounts, stock levels and order confirmations directly with your customers enables them to manage their order from research, through to purchase and delivery or collection using just one device. By streamlining the online shopping process at all stages you provide your customers with an m-commerce friendly service, encouraging loyalty and return spending. 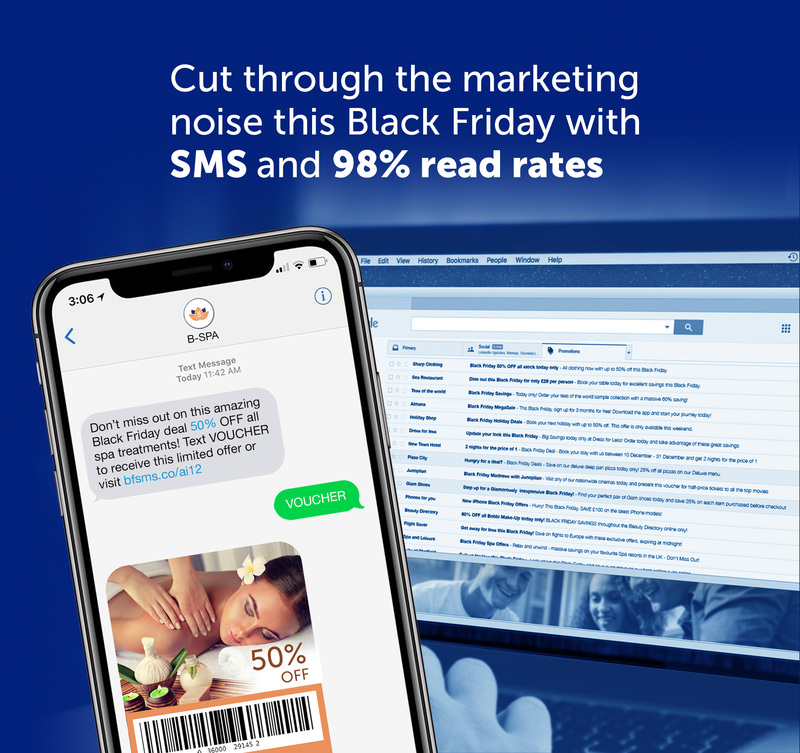 To discuss the opportunities of mobile messaging for your Black Friday promotions, get in touch with our sales team today or download our latest guide here.